Wow, my blog has been neglected. I'd like to say that's going to change, but honestly I have a couple half written trip reports and some videos to edit and upload, and I don't know when I am going to do that. I have been tired. I spent 11 hours in bed yesterday. That's part of why I'm getting to my week in review on Wednesday after 9 pm. Work was pretty quiet this past week because we were on the standard two week shut down for repairs and maintenance. In other words, some of the things we would like to get done will have to wait until shutdown is over. I spent some time this past week studying oil. It's pretty interesting stuff and since the actual chemistry of it is hard to find, it is rather hard to describe why one oil is better than another. Fun fact, GL-5 oil wears away at copper parts 2-3 times faster than GL-4 oil wears away copper parts, and I wish I had a better source for that. Running was okay. The highlight workout of the week was a 2:40 run on trails over 17 miles that started with a heat index of 106ºF and ended with a heat index of 98ºF. I drove 15 minutes home, drank probably 1.5 liters of milk and orange juice, showered, and went to bed. I didn't even eat supper I had no stomach for it. On Tuesday I put an offer down on a house, more details to come on that. Yes, it seems to have been accepted and now I'm working through the paperwork, and bills. 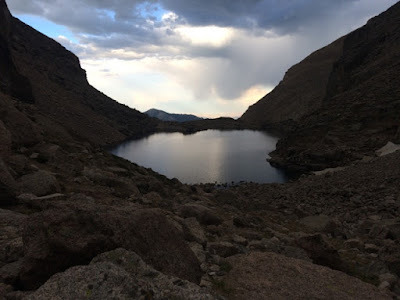 Friday I drove out to Denver, and Saturday hiked up to Chasm Lake to spend the night before attempting the Casual Route on the Diamond on Longs Peak. Sunset looking East from Chasm Lake Bivouac at 12,000 feet.